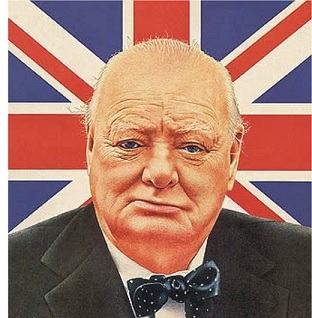 Winston Churchill (1874-1965) - The man who defied Hitler and saved Great Britain (as well as perhaps all of Europe) from Nazism, Winston Churchill was the right man at the right time to do the job. With his charismatic presence and his powerful speeches, he rallied the British people in the face of overwhelming odds. From the defeat of the French in June of 1940, until the invasion of the Soviet Union in June of 1941, England stood alone against the German war machine and withstood a brutal onslaught. He was prime minister on two separate occasions; from 1940-45, and from 1951-55. It was his first stint in office for which he is most remembered; during the height of the greatest conflict the world has yet seen. His father was an English duke and his mother was an American. As a young man, he served as a British officer in the cavalry and saw action during the Second Boer War in South Africa. After he retired from the military (the first time) he entered politics, but his career was almost ruined in 1915 during the First World War. As First Lord of the Admiralty, he played a major role in planning the Gallipoli Campaign against the Ottoman Empire. The campaign ended in disaster and Churchill took most of the blame (eventually resigning and joining the military a second time). He was not able to fully rehabilitate his career until the outbreak of World War II (although he was a talented writer and authored several books in the intervening years). The war had divided the British public between those who saw it as inevitable and those who wanted to avoid it at almost any cost. Prime Minister Neville Chamberlain fell into the second category. He agreed to Adolf Hitler's pre-war demands in exchange for "peace in our time". However, the invasion of Poland by Germany was an act of aggression that could not go unanswered. In light of Chamberlain's previous actions, most of the public and those in government had lost confidence in him. To try and restore it, Chamberlain brought Churchill into his War Cabinet and appointed him First Lord of the Admiralty (the same position he held before Gallipoli). But a series of poor decisions leading up to the German invasion of Norway forced Chamberlain to resign on May 10, 1940 (the same day Hitler invaded France). Upon Chamberlain's recommendation, King George VI asked Churchill to become the new prime minister and Churchill accepted. From the start he had to pull the country together in order to face the threat posed by Nazi Germany. On June 4, 1940, he made his "We shall fight on the beaches" speech before the House of Commons; one of the most famous speeches ever delivered (on par with Lincoln's Gettysburg Address). In it, he vowed that England would never surrender. It wasn't long before his words were put to the test. France fell in only six weeks and Great Britain was the sole country left in Western Europe. Hitler offered a truce to Churchill and about half his cabinet urged Churchill to accept it, but he refused. Hitler unleashed his fury over the next several months in the Battle of Britain, but England refused to capitulate. Churchill remained in the public eye hardening the citizens' resolve in the face of destruction. The British RAF fought so admirably in fending off the German Luftwaffe that Churchill famously said, "Never in the field of human conflict was so much owed by so many to so few". Finally, at the end of October, 1940, Hitler was forced to abandon his planned invasion of the British Isles. It was his first major defeat of the war. By itself, Great Britain could never defeat Germany; but in 1940, while it stood alone, it refused to lose. And after Hitler invaded the Soviet Union, and Imperial Japan attacked the United States at Pearl Harbor the following year, Great Britain no longer had to stand alone. It finally had the allies it needed to win the war. Churchill had promised to stand up against Hitler, and he followed through on that promise. And it for this that he is regarded as one of the most significant figures of the 20th century.